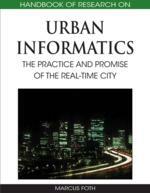 This chapter defines, explores and Illustrates research at the intersection of people, place and technology in cities. First, we theorise the notion of ecology in the social production of space to continue our response to the quest of making sense of an environment characterised by different stakeholders and actors as well as technical, social and discursive elements that operate across dynamic time and space constraints. Second, we describe and rationalise our research approach, which is designed to illuminate the processes at play in the social production of space from three different perspectives. We illustrate the application of our model in a discussion of a case study of community networking and community engagement in an Australian urban renewal site. Three specific interventions that are loosely positioned at the exchange of each perspective are then discussed in detail, namely: Sharing Stories; Social Patchwork and History Lines; and City Flocks. The intersection of urban and new media studies is a dynamic field of practice and research. There are a number of reasons why this is so. Technically these are both highly innovative domains, and the rate of change is significant and challenging. Urban life and media platforms are both in the midst of paradigm shifts. Theoretically, both fields can be understood as sites of signification and structuration of the social field—and because they both evidence such change they are potent laboratories for advancing understanding. The pragmatic corollary is that policy makers and corporate investors are also highly engaged in the intersection. Apart from the complexity of maneuvering through the often differing agendas of researchers and practitioners and of private and public sector agencies that operate at this intersection, the objective of advancing understanding is also challenged by a plethora of different and sometimes differing theories. Yet, universally useful contributions to knowledge can be achieved if urban cultural studies, urban sociology, urban technology and human-computer interaction, urban architecture and planning, etc., overcome language and conceptual barriers. A cross-disciplinary approach requires effort to create models which help to overcome phenomenologically isolated attempts at explaining the city. Such models would ideally be cross-fertilised by the findings and insights of each party in order to recognise and play tribute to the interdependencies of people, place and technology in urban environments. We propose the notion of ecology (Hearn & Foth, 2007) as a foundation to develop a model depicting the processes that occur at the intersection of the city and new media. • Culture and History (Antrop, 2004; Burgess, Foth, & Klaebe, 2006; Klaebe, Foth, Burgess, & Bilandzic, 2007). Master-Planned Communities: are urban developments guided by a central planning document that outline strategic design principles and specifications pertaining to road infrastructure, building design, zoning, technology and social and community facilities. They are usually built on vacant land and thus in contrast with the type of ad-hoc organic growth of existing city settlements. Collective Interaction: is characterised by a shared goal or common purpose, a focus on the community rather than the individual. The interaction is more public and formal than private and informal, and resembles many-to-many broadcasts. The mode of interaction is often asynchronous, permanent and hierarchically structured. Technology that supports collective interaction includes online discussion boards and mailing list. Networked Interaction: is characterised by an interest in personal social networking and a focus on individual relationships. The interaction is more private and informal than public and formal, and resembles a peer-to-peer switchboard. The mode of interaction if often synchronous, transitory and appears chaotic from the outside. Technology that supports networked interaction includes instant messengers, email and SMS. Local Knowledge: Knowledge, or even knowing, is the justified belief that something is true. Knowledge is thus different from opinion. Local knowledge refers to facts and information acquired by a person which are relevant to a specific locale or have been elicited from a place-based context. It can also include specific skills or experiences made in a particular location. In this regard, local knowledge can be tacitly held, that is, knowledge we draw upon to perform and act but we may not be able to easily and explicitly articulate it: “We can know things, and important things, that we cannot tell” (Polanyi, 1966). Triple Play infrastructure: combines broadband Internet access, television reception and telephone communication over a single broadband connection, usually a fibre optic network. It is a marketing term which refers to a business model offering a bundle package of all three services accessible over the same network infrastructure. Communicative Ecology: as defined by Hearn & Foth (2007), comprises a technological layer which consists of the devices and connecting media that enable communication and interaction. A social layer which consists of people and social modes of organising those people—which might include, for example, everything from friendship groups to more formal community organisations, as well as companies or legal entities. And a discursive layer which is the content of communication—that is, the ideas or themes that constitute the known social universe that the ecology operates in. Digital Storytelling: refers to a specific tradition based around the production of digital stories in intensive collaborative workshops. The outcome is a short autobiographical narrative recorded as a voiceover, combined with photographic images (often sourced from the participants’ own photo albums) and sometimes music (or other sonic ambience). These textual elements are combined to produce a 2-3 minute video. This form of digital storytelling originated in the late 1990s at the University of California at Berkeley’s Center for Digital Storytelling (www.storycenter.org), headed by Dana Atchley and Joe Lambert.